Bertie Pennell was born on 13 August 1886 at Yeovil, the son of ironmonger's porter William Pennell (1855-1923) originally from Odcombe, and Elizabeth née Totterdell (1854-1926). (There was, in fact, another Bertie Pennell born in Yeovil just three or four years after 'our' Bertie and many so-called genealogists relish in the apparent amalgamation of both lives. The 'other' Bertie Pennell was brother of Reginald Pennell also killed at the Somme in 1916). In the 1891 census William and Elizabeth were listed living at 7 Duke of Clarence Court with their children; Ernest, Ada and Bertie - aged 10, 6 and 4 respectively. By the time of the 1901 census the family had moved to 1 Dampier Street and 14-year old Bertie was working as a butter maker - presumably at the Aplin & Barrett factory in Newton Road. On 20 April 1903 Bertie started work as a cleaner at Yeovil Station for the Great Western Railway Company at the rate of 1s 9d. He clearly didn't enjoy the work as he resigned on 23 May 1903. In the spring of 1907 Bertie married Winifred Florence Nichols (1888-1963) and they were to have four children; Kathleen Ada (1907-1986), Ena Winifred (1910-1912) and two children whose names I couldn't discover. By the time of the 1911 census Bertie and Winifred, together with their two girls, were living at 11 Cecil Street. At this time Bertie was employed as a leather dresser. When war broke out in the summer of 1914 Bertie was working in South Wales and enlisted at Abertillery, Monmouthshire, as a Private in the 14th (Pionéer) Battalion, Worcestershire Regiment (Service No 25453). In 1914-15 the protracted trench-warfare in France and Flanders had resulted in an ever-increasing demand for skilled labour to supplement the work of the Sappers in the construction of redoubts, emplacements and other field works; and during 1915 it was decided to form special Pionéer battalions to meet that demand. Those Pionéer battalions were not intended to be non-combatant “labour” units. Their creation was inspired by the famous Pionéer regiments of the Indian Army and, like their exemplars, the new units were designed as fully equipped battalions, skilled in constructive work but equally capable of fighting in the fore-front of battle. To indicate their combatant status it was decided that those new Pionéer battalions should be designated as numbered battalions of various regiments of the Line. The new Pionéers were recruited for the most part in the great mining districts of the North Country and of Wales; but there were abundant recruits of the needed knowledge and physique in the Severn Valley; and from that sterling material Colonel Sir Henry Webb raised at his own expense, a complete Pionéer battalion, known first as the “Severn Valley Pionéers” and later designated the 14th (Pionéer) Battalion of the Worcestershire Regiment. The new Battalion was formed in the autumn of 1915 and was first quartered at Norton Barracks. The Pionéers remained at Worcester until the following spring, when the Battalion moved to Salisbury Plain. At Larkhill and later at Codford the Pionéers worked hard to complete their training. The training of the Pionéers had to be more detailed than that of the other Battalions, since technical knowledge was added to the requirements of battle, and the work on Salisbury Plain was hard; but all ranks maintained the utmost enthusiasm, and the Battalion was much over strength when orders came in June to proceed to France. There was keen competition to be among those selected for the front; and after some busy weeks of final preparations the Pionéer Battalion left Salisbury Plain on the 19th June 1916 and entrained for Southampton. The 14th (Pionéer) Battalion crossed from Southampton to Havre on the night of 20/21 June 1916 and arrived at Havre on the morning of 21 June. After twenty-four hours in Base Rest Camp, the Battalion entrained and proceeded to the front; finally detraining at Bruay on 23 June and marching to billets at Chamblain Chatelain. There the Pionéers came under the orders of the 63rd (Royal Naval) Division, of which henceforth they were to form part. On the 24th June 1916 the 14th Worcestershire marched forward towards the line, and that evening settled into bivouac in the Bois de la Haie, south of the great ridge of Notre-Dame-de-Lorette and some three miles from the battle-front. The Battalion was destined to remain in that neighbourhood throughout the ensuing three months, the various companies and platoons being employed separately in work on the surrounding defences. The working parties were continually under fire but fortunately the losses of the Battalion were not heavy. Total casualties of the 14th Battalion from July 1st to September 17th - 4 killed, 8 wounded. In the middle of September 1916 the 63rd Division was relieved in the line by the 37th Division, and moved back into reserve to rest and train. The 14th Worcestershire marched west by stages, on 17 September to Hermin then 18 September to La Thieuloye. Thence, after a week’s rest the pionéers marched south on 24 September to Ternas. There training was carried out until the beginning of October 1916. At the beginning of October 1916 the 63rd (Royal Naval) Division had been transferred from the First Army to the Fourth Army. The move of the Division from the back areas near St Pol forward to the Somme front had begun on 4 October 1916 (the transport of Battalions moved on the previous day), on which day the 14th Worcestershire and the other battalions of the Division had moved by train from Ligny St. Flochel to Forceville. After two nights in the latter village, the 14th Worcestershire moved on 6 October to a camp midway between Beaussart and Mailly Maillet, where the Headquarters of the Battalion lay during the next ten days while the four companies worked on the defences in front. Enemy shell-fire caused some few casualties, with 3 killed and 4 wounded. On 17 October camp was shifted to the outskirts of Englebelmer and the work was continued (casualties 4 wounded). Four days later camp was shifted again, to a little valley midway between Englebelmer and Martinsart on the reverse slope of the spur which runs north from the latter village. That camp was the Headquarters of the Battalion during the subsequent operations, and from that camp as a centre the four companies of the Battalion went out working each day. On 23 October 1916, presumably while in a working party, Bertie was killed in action. He was aged 30. On 17 November 1916 the Western Gazette reported "Private Bertie Pennell, youngest son of Mr and Mrs W Pennell, of 1 Dampier Street was killed in action in France on or about the 25th October. Priv Pennell was working in Wales at the outbreak of war, and enlisted in the Worcestershire Regiment. His wife has received the following letter:- “I take the opportunity of writing these few lines to assure you of the deepest sympathy of the officers, non-commissioned officers and men of the --- Battalion, and especially of A Company. As his platoon officer, I can honestly say that your husband was one of the best and most trustworthy men in my platoon to have in the trenches and in camp, and there are not many men one can say of that. You have one great consolation in your sorrow that there is One above who cares for him now that he has passed the barrier into happiness, and Who cares for all who have done their duty loyally and nobly. What duty or sacrifice is more loyal and noble than to lay down one’s life for King and country." Private Pennell, who was 30 years of age, leaves a widow and four children." 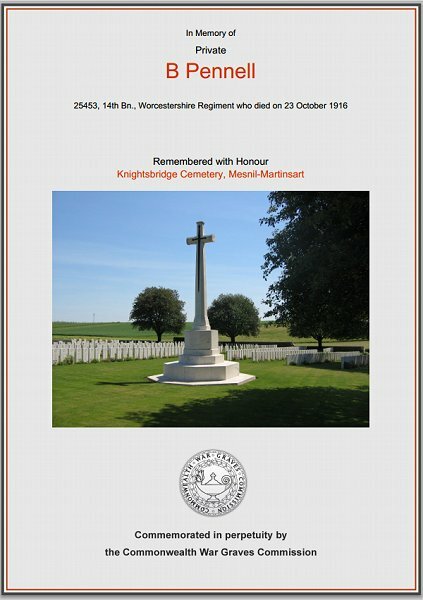 Bertie was interred in Knightsbridge Cemetery, Mesnil-Martinsart, Somme, France, Grave F.56 and his name is recorded on the War Memorial in the Borough. He is also commemorated on the Abertillery Central Memorial, Somerset Street, Abertillery and on the St. Michael’s Church Memorial, Church Street, Abertillery. The Commonwealth War Graves Commission certificate in memory of Bertie Pennell.